“Evy’s” athletic began at Northwestern High School in Detroit and took him al the way to Iowa City, where he made his fame as head coach at the University of Iowa. In between, he had an important stop in Ann Arbor and lettered in both baseball and football at the University of Michigan. During his three seasons for the Wolverines, Evashevski started all but four games at quarterback and was All-Big Ten each year. He gained his most fame as the blocking star for All-American running back Tom Harmon. For three seasons (1938 ,39,40) the duo led Michigan to 19 victories against only four losses and one tie. With Evashevski leading the way, Harmon went on to win the Heisman trophy in their senior year. Evashevski turned down pro football to join the college ranks as a coach. He was an assistant at Michigan State for three years (1947,48,49) and then was named head coach at Washington State. After only two years at WSU, he took over at Iowa. The rest is history as “Evy” led the Hawkeyes to Big Ten Titles and Rose Bowl victories in 1956 and 1958. In nine seasons his Iowa teams posted a 52-27-4 won-lost-tied record. He was inducted into the National Collegiate Hall of Fame in 2000. It was a long time coming, but legendary football coach Forest Evashevski has finally been elected into a national Hall of Fame – not one, but two. In March of this year “Evy” was elected into the National Polish-American Sports Hall of Fame and only a few weeks later it was announced that he will be inducted into the National Collegiate Football Hall of Fame in New York City in December. Evashevski’s athletic career began on the west side of Detroit at Northwestern High School and took him all the way to Iowa City, Iowa where he made his fame as head football coach and later athletic director at the University of Iowa. His first stop after high school was in Ann Arbor at the University of Michigan. Evy lettered in both baseball and football for the Wolverines, but gained his most fame on the gridiron as the blocking quarterback for All-American halfback Tom Harmon. For three seasons (1938-39-40) the duo led Michigan to 19 victories against only four losses and one tie. With Evashevski leading the way, Harmon became one of the country’s greatest running backs of his era and won a Heisman Trophy in 1940. During those three seasons Harmon rushed for 2,134 yards, scored 33 touchdowns, threw 16 TD passes and also kicked extra points and field goals. Evashevski was Michigan’s leading receiver in 1939 with 14 catches. During his three years under Coach Fritz Crisler, Evashevski started all but four games at quarterback and was All-Big Ten each season. He was captain of the 1940 squad, a second team All-American, an Academic All-American and started in the East-West and Chicago All-Star post-season games. A first-round draft choice of the Washington Redskins, Evashevski decided to pass up professional football and enter the coaching ranks. His first position was head coach at tiny Hamilton College in upstate New York. He left after the 1941 season to join the U.S. Army during World War II. Evashevski returned to football as an assistant to Biggie Munn at Michigan State College. After three seasons with the Spartans (1947-49), the young football genius got his first big-time coaching position as the head man at Washington State. It took him only two years before being discovered and he signed on to take over a struggling program at Iowa in 1952. His first team won only two of nine games, but by 1956 he had rebuilt the Hawkeyes into a national power. Evashevski coached Iowa to Big Ten championships in 1956 and 1958, following each with a Rose Bowl victory. His 1956 squad won Iowa’s first Big Ten title since 1922 and then crushed Oregon State, 35-19, in Pasadena. Two years later the Hawkeyes won the Big Ten championship again and routed California, 38-12, for another Rose Bowl crown. 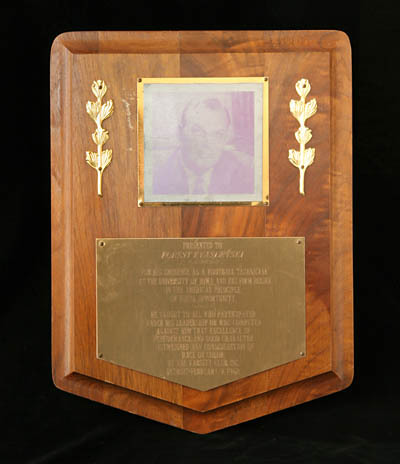 Following the 1958 season, Evashevski was named Coach of the Year and Iowa placed second in both the final Associated Press and United Press polls. The Hawkeyes also became only the third Big Ten team to rank nationally in the top 10 for three consecutive years. Evashevski unveiled the wing-T offense in 1956 and it was built around quarterback Kenny Ploen. The results were devastating to the opposition. Among Evashevski’s many great players at Iowa were two who went on to star for the Detroit Lions – defensive tackle Alex Karras and tight end Jim Gibbons. During his nine seasons at Iowa, Evashevski’s teams won 52 games, lost 27 and tied four. His 1958 squad led the nation in total offense and was voted #1 by the Football Writers Association and won the Grantland Rice Trophy. He never had an undefeated team, but his ’56, ’57, ’58 and ’60 teams each lost only one game. Evashevski walked away from coaching after the 1960 season, in which the Hawkeyes won eight of nine games, to become athletic director at Iowa. He stayed in that position for 10 years before retiring. Many football fans are astonished to realize he was only 40 years old when he ended his coaching career and just 50 when he stepped down as athletic director. At one point in his career he almost left the college ranks to be a professional football coach. He was a finalist for the head job with the Green Bay Packers, but took himself out of the competition. The Packers then hired a little-know assistant with the New York Giants – Vince Lombardi. For a number of years after leaving Iowa, Evashevski worked as a television analyst for the ABC Network on college games and then did radio commentary for the Iowa Football Network. He and his wife, Ruth, have seven grown children and divide their time between a summer home in Petoskey, Michigan, while wintering in Vero Beach, Florida. One of his sons, Forest Jr., – better known as “Frosty” – followed in his dad’s footsteps and was a quarterback at Michigan for the 1962, ’63 and ’64 seasons. Another son, Jim, lettered in golf for the Wolverines. Forest Evashevski has an explanation for the unusual “Polish” spelling of his last name. “By the way, he never revealed to us the original spelling of Evashevski,” the new Polish Hall of Famer added.